Here are a few fun fall events going on this upcoming weekend to embrace the autumn spirit! This is an annual event held the third Saturday of October. A family free event that celebrates the main crop of South Central PA, with over 100 art, craft and food vendors along Main Street. It creates an excellent venue for holiday shopping and good food. Live entertainment at the Courthouse Plaza adds to the festive atmosphere. Apple related products, services and contests are featured for this family-friendly fall festival. Set aside this day to enjoy a trip to the pumpkin patch and orchard to gather your pumpkins, apples and smiles! With a large selection of fall decorations, crafts fresh food and bakery sweets you and your family will be sure to have a wonderful day. The event includes; pick-your-own-pumpkin patch; corn maze; pumpkin painting; wagon rides; straw bale jungle gym; corn boxes; antique apple cider press demonstrations; face painting and much more. On the one side this festival is like many others, with a wide variety of delicious foods, fun activities , homemade crafts, there is a little bit of something for everyone. On the other hand, medieval weaponry fires ballistic pumpkins hundreds of yards into a lake. At the Punpkin’ Chunkin’ Festival it should be obvious what the big draw is. Large chunkin’ trebuchets are designed and brought in specifically to hurl pumpkins with great force and greater accuracy. Those teams who excel in the best feats of endurance and power take home the prize. 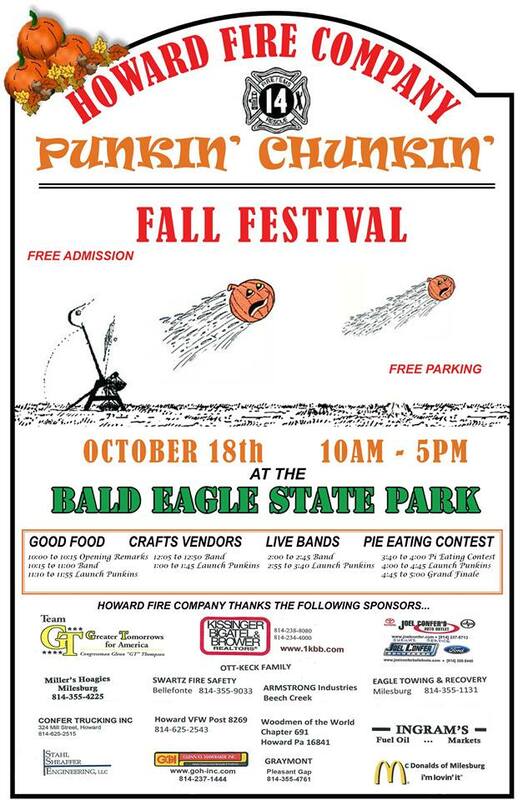 Despite being the namesake of the festival, punkin’ chunkin’ isn’t the only thing to do at the festival….for more information click here. A fall festival stuffed with unique and exciting events. There will be traditional fall activities like garden tours, pumpkin decorating and a scarecrow display. Vendors will be selling their homemade products and there will be drumming circles and fire-performers. Bring the whole family and have a great experience. Hosted by the Sons of the American Legion, Yorktoberfest has been growing insanely in terms of size and fan base since it began in 2011. With a large selection of brews, wines and vendors the appeal is at once immediate and obvious. Yorktoberfest is a good-time festival . Nearly fifty craft brews are represented, all from state and regional breweries. Everyone from PA’s Troegs to Dogfishhead to the local favorites, Liquid Hero Brewery, are represented at the festival. There will also be nearly a dozen wineries from across the area showcased with a wide selection of red, whites and seasonals. Make sure you come hungry because there will be plenty of food vendors, fifty to be exact. Attendance for this event is severely limited and totally worth it. Be sure to get tickets (to consume alcohol) asap. All proceeds go to charity programs. Next Post To Move or Improve?